Author(s): Yi Xia, Menghua Wang, Eliana Beraldi, Mei Cong, Amina Zoubeidi, Martin Gleave, Ling Peng. Innovative Drug Research Centre, Chongqing University, Chongqing, China. 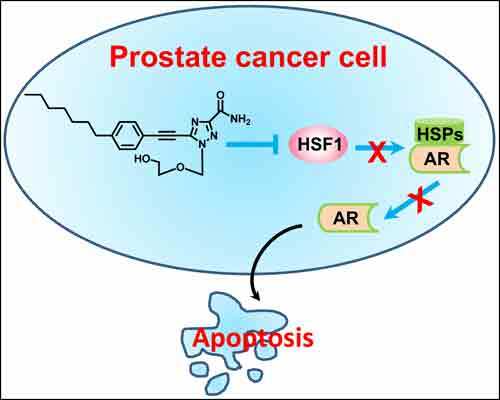 A novel triazole nucleoside analogue was discovered to exhibit potent anticancer activity in prostate cancer cells via down-regulating heat shock factor 1 (HSF1) and related heat shock proteins, along with the consequential inhibition of androgen receptor (AR) expression and transactivation, arresting the cell cycle in AR-governed phase. This triazole nucleoside therefore constitutes a novel structural paradigm and potential drug candidate for prostate cancer through inhibition of HSF1 and AR. Keywords: Androgen receptor, anticancer activity, heat shock proteins, heat shock factor 1, nucleoside analogues, prostate cancer. Affiliation:Innovative Drug Research Centre, Chongqing University, Chongqing, China. Keywords:Androgen receptor, anticancer activity, heat shock proteins, heat shock factor 1, nucleoside analogues, prostate cancer. Abstract:A novel triazole nucleoside analogue was discovered to exhibit potent anticancer activity in prostate cancer cells via down-regulating heat shock factor 1 (HSF1) and related heat shock proteins, along with the consequential inhibition of androgen receptor (AR) expression and transactivation, arresting the cell cycle in AR-governed phase. This triazole nucleoside therefore constitutes a novel structural paradigm and potential drug candidate for prostate cancer through inhibition of HSF1 and AR. Anti-Tumour Effects of Bisphosphonates - What have we Learned from In Vivo Models?